In what was originally looked at as a stroke of genius, we were all treated to trailer spots for The Cloverfield Paradox during the Super Bowl, and as the game went on, more information starting flowing, and it became apparent that we were going to treated to a new Cloverfield film immediately following the game. This all happened really quickly. 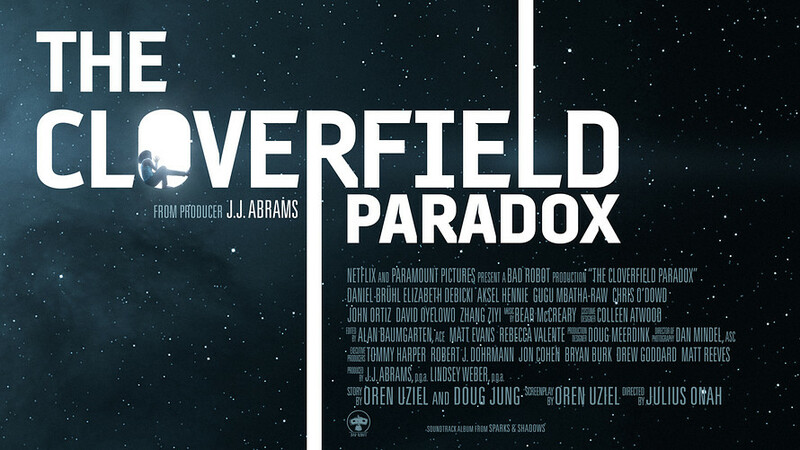 The Cloverfield Paradox, at one point named God Particle, has been in the pipes for a while–many Cloverfield fans had been anticipating it, and we thought we were going to be getting a theatrical release in February. However, as the date got closer and closer, with no news, no trailer, nothing at all, it became clear that we weren’t getting this film in February, and so rumors started floating that it would get a release around April. But–still, no trailer?! Where’s the news for this film? Where’s the marketing? Where’s that Cloverfield charm that we all know and love so dearly? But then, the Super Bowl spots. And a lot of excitement. Hey, this is a big deal, and not just to fans of Cloverfield. To have a full, feature length film, one that was scheduled to be released in theaters, to now be released moments after the Super Bowl ends? That’s a trailblazing moment. The problem with this, however, is that the movie needs to deliver. It needs to resonate with folks. For this movement of releasing big budget films straight to Netflix or other streaming platforms to gain true momentum, yes, the name matters, but the results matter even more. And The Cloverfield Paradox is a complete sham on almost every front. It’s an embarrassing film, and it hurts all the more because this was supposed to continue in the lineage of Cloverfield films–to say, they are unique, they have an aura of charismatic frustration, and they rely on tense performances to maneuver the story along and continue to cultivate the enigma surrounding this universe. But…the movie has to be good. The Cloverfield Paradox is awful. Perhaps even more frustrating is that the Cloverfield mythology feels completely squeezed in to this film. On its own, it’s already not very good–mainly due to a really flat and boring story that is convoluted enough to make your head spin, and some of the worst characters you’ll encounter. Sci-fi, to a large extent, should be campy and have an element of oddball fun. But spoiler–when a guy loses half his arm to the deep unknown, and doesn’t at all respond in any significant way but to crack a joke when he sees the hand slithering around on the ground–whatever fun and creepy element the movie is going for just loses its attempt to surge the story in a palpable direction that is satisfying. 10 Cloverfield Lane worked because A) the cast was legendarily good. John Goodman owned his role and was subsequently snubbed at the Oscars for it (I know, it was always a longshot, but hey, he deserved some award recognition there), and B) it actually felt like it was apart of the Cloverfield universe. We all saw the first Cloverfield and knew what the little details of 10 Cloverfield Lane were alluding to. We knew there was a greater presence at play within the overall context of the story. The ending notwithstanding, this was a film that was pretty dang good, and even if you take all of the Cloverfield stuff–it’s still a really, really good movie. Paradox plays off like a film that’s trying way too hard to conjoin itself with the great Cloverfield franchise, and it really leaves a bad taste to view this film as a continuation of what this franchise has done, and what it’s trying to do moving forward. Let’s be real here: there’s an opportunity with this property. A real chance to do something good and unique and interesting. It’s clear at this point that we’re never going to get a true sequel to Cloverfield, and yes, that is definitely a punch to the gut. But if they’re going to keep trying to expand our surroundings and the scope of what is happening within this world, they’ve got to do a better job of injecting stories that at least make sense within the context of what we’ve gotten so far, without trying to manufacture the Cloverfield brand. J.J. Abrams, you’ve got a fanbase here that is giving you the benefit of the doubt, but I believe patience is running thin. If Overlord doesn’t pan out, I just don’t know how this franchise can regain its footing. Or you could, you know, just give us the true Cloverfield sequel we all want and stop playing with our emotions. That would fix this right up.